A "polder" is a tract of land reclaimed from the sea by high embankments. In 1608-1612 the Banestra Lake was drained under the direction of Jan Adriaenz Leeghwater (1575-1650), a carpenter and hydraulic engineer and dykebuilder. The lake was ten feet deep and was drained in one year with 26 windmills. His portrait appears in the upper left-hand corner of the souvenir sheet. The background of the sheet is a map of the Beemster polder after the lake was drained and the land surveyed. It is based on the map Agri Biemstrani Descriptio by Petrus Kaerius, published in 1617. The stamp was issued in honor of Amphilex, the International Stamp Show held in Amsterdam in 2002. On February 1, 1953 a combination of spring floods and heavy storms put large areas in the south-western part of the country under water. This disaster, which cost nearly 2,000 lives, underlined the urgency of completing the Delta Project, the plan to construct a network of barriers closing off the estuaries in the south west. with the exception of the New Waterway and the Western Scheldt, which remain open to allow shipping access to the ports of Rotterdam and Antwerp, Belgium. The Eastern Scheldt basin has been closed off by means of a storm surge over 3,200 meters long. Normally the gates remain open and permit the sea to flow in and out of the Eastern Scheldt; in stormy weather they are lowered to protect the estuary from high water levels. On October 4, 1986, Queen Beatrix officially marked the completion of the Delta Project by opening the storm surge barrier in the Eastern Scheldt. 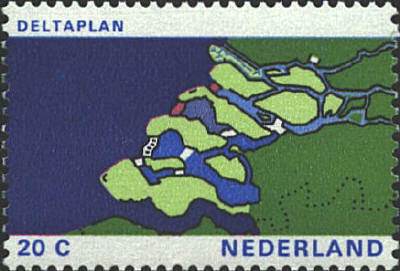 The stamp, issued in 1972, shows the project as it was expected to appear on completion.